Gimp, Sprinkles, & Comics - ...	Kate Spade Trench - love love love!!! Fussy Footed Ladies: SHOE FIND! I don't have fussy feet and can really prance around in just about anything, so I don't have to seek out comfortable shoes. That said, I have A LOT of shoes, from a wide range of brands, so I've done a huge amount of comparison ... walking. 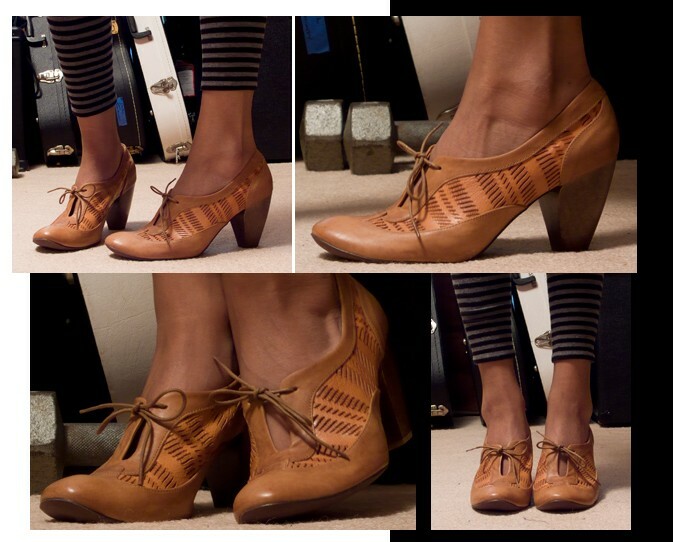 I bought a pair of Coclico shoes via MyHabit last week, and WOW. They have a 3-inch heel, which feels more like 1-inch, and they might just be the most comfortable shoes I own right now - that's including my range of flats. Coclico is made in Spain and their website prices (shopcoclico.com) seem to be akin to Fluevog's, but if you're interested, they can still be found at MyHabit http://www.myhabit.com/#page=b.....=qd_d_bc_b who ships free both ways! I'm currently in the midst of talking myself out of buying a pair of every style they have left in my size. I'm heading over to take a look. . . it's always nice to find a brand of shoes that you trust! Wow, those are beautiful! Sally of Alreadypretty.com also sings high praises for this brand. Darling, and OMG, do I love the striped leggings, too!!! I want both, although my limit/comfort zone is usually no more than two inches. OMG these shoes are ADORABLE! Thanks for the brand suggestion! That's an awesome shoe, and I'd love it in black if the heel weren't so high. Love these shoes and how you've styled them with the leggings! I rushed over to MyHabit and created an account. OMG, these are beautiful! Thanks for the review. I put them in my cart and hit send! Can't wait to try them on. Thank you!!! Vicki & Jewell - I know a lot of women's feet aren't made for a higher heel, but these 3" ones felt so much like a single inch, that I actually measured them to make sure they were the stated height. If for whatever reason you 'need' a higher heel at some point, these could really do it. Firecracker - I giggled at the idea that I had 'styled' them with my leggings. I threw the shoes on while wearing my house clothes! SuzanneM - I hope they work out! How do you do that GX? Your feet look like they are ever so gently cradled in these shoes. No tightens where the laces meet the front of your foot---these must be great fitting!!! They look pretty darn good on you also!! So wonderful! Isn't it nice when you'd buy them for their looks alone, and then they give you a cushy ride, too? Those are beyond adorable. I've always admired Coclico shoes, and now I might just have to give them a try. Nice find! Those are really beautiful shoes. Thanks for sharing. Thanks so much for sharing Girl X. I have a pair of Coclico boots I've never worn purely because of pickiness on colour. They are STUNNING and they come in half Euro sizes - the 39.5 fit me PERFECTLY and most other shoes are a compromise of too big or too small on me. They feel lushly comfortable, just wonderful. Girl X, the MyHabit website has these shoes in American sizes, which I'm hesitant about and find conversions can be inconsistent. Could you tell me, are yours marked with a Euro size? If so, what American size did you have to order? This might help me figure out my size. You made me love these and then they are sold out in my size. Putting them on my radar now. Thanks for the enabling GX!! Fruitful - Mine are marked as a 38, and I bought the American 8. If you're normally a 39.5 EU, then you're most likely a 9.5 American. Good luck - and let us know which ones you wind up with! JJSloane - Oh no! They'd look SO cute on you too! Thanks so much Girl X! Will have to wrestle with my fashion conscience - there are a lot of things I want to get right now, but only limited funds - these are on my shortlist! LOVE THOSE SHOES!!! Those are the type of shoes I wear in the warmer months so I'll be glad to check out that site. These are fabulous-looking shoes! Thank you so much for posting this review. I've had a membership with MyHabit for awhile now, but haven't bought anything yet. Also wanted to say thank you to Fruitful for asking about sizing and and to you, Girl X, for replying about sizing. I've never quite figured out how I could be a 38 in Euro shoes which is supposed to represent something like a 7.5 or so, when a lot of other shoes I own are a US size 8. Seems the mystery and confusion has been solved - thank you! 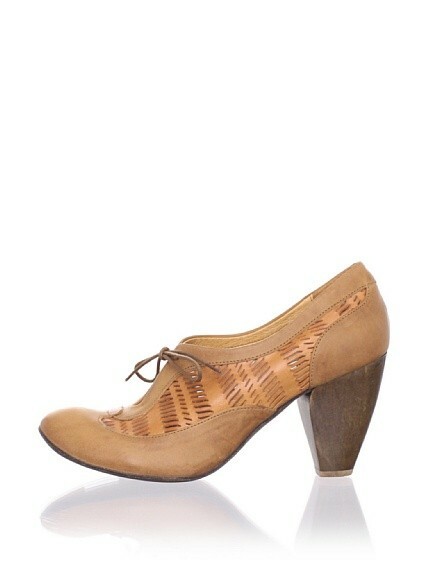 I might just have to order these shoes - they are gorgeous. That said, I don't normally like to wear heels that high. Do you normally wear heels like this? I don't, but these shoes look so fabulous and after reading your review about how comfortable and well made they are, I'm seriously tempted. Such beauties! Thanks for sharing, Girl X. Another brand to keep an eye out for! For fussy-footed folk, I think it's a big deal just to add to the number of brands you can consider, given the list is often counted on the fingers of one hand. Gorgeous girlx. Thanks for introducing me to a new brand. VC - I do wear heels often, so the 3" height is really doable for me. If the shoes actually felt like a 3" heel, I would have been fine with that, so having them feel like a 1" heel was kind of awesome. I don't know why they feel so much lower than they measure, since they don't have a platform or anything like that. It might really just be that the heel is so wide and stable. If you're looking to try a higher heel, these are definitely worth a go - especially if you're in the US and can utilise their free shipping/returns. By the way - a quick note about MyHabit returns - they process their returns really quickly, and will send an email stating that you've received a credit to your account. If you want the amount put back on your credit card instead (which is always my preference), you have to give them a call and let them know. An extra step, but a fast and easy one. Velvetychocolate (great username! ), I think there might be vanity sizing in footwear. That's why I cling to Euro 39.5 as my touchstone. Although occasionally a Euro size is way off, I find the ones I come across are fairly consistent. On the other hand, I own US (and Australian - despite what the conversion charts say, Australian and US sizes are normally the same) shoes that are all over the place. I have shoes sized 8.5, 8, 9 and even 7.5? What's with that? I do have to size down to a 39 due to lack of half-sizes most of the time (my right foot is 39, left 39.5) but that doesn't account for the wide variation. It might help to know that Euro sizes don't have exact American equivalents, as the size increments are different. Euro increments for full sizes are 0.6667cm; US increments are 0.8467cm. This might be why some reviews by Americans of shoes that have had their Euro size pre-converted into US size by a website, say that shoes run way too big or small (I know shoes can run untrue to size, but my Coclicos are the truest to size I've had for years, even though websites said they ran small). ETA this is also why Coclicos are treasures: they do come in the relatively rare Euro half-size, which is one reason why the fit is virtually custom.